We saw him fill five tall canvases over five days. Paint splattered and smeared, sometimes scooped and splashed. Once in a while a brush drew a delicate line, a small detail bringing life. Wonder and anticipation filled us, eyes trained on the creation... waiting for the moment when we could see. It was Camden's favorite part of the National Youth Gathering... watching the Jesus Painter create on the stage, waiting with suspense. The face of Jesus. His outstretched hand. The art of love and grace. I loved sitting beside my son as he watched it all. 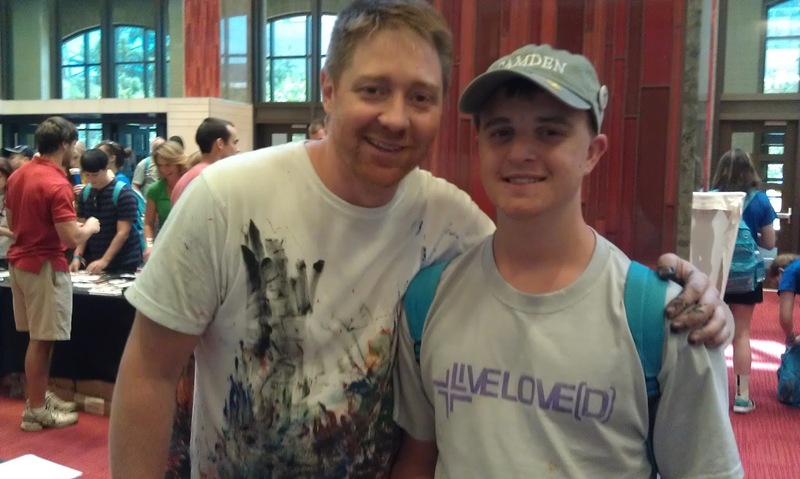 Cam had the chance to meet Mike Lewis, and shake his paint stained hand. The Jesus Painter also signed the print Camden bought. I think about this piece of art... what it speaks, and where it will go. I think this is a forever piece... one that will always be part of Cam's home, and heart. 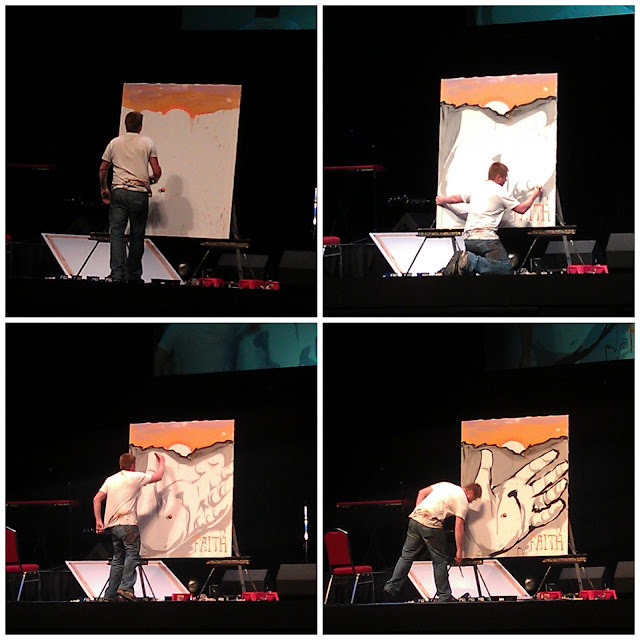 Jesus is the artist, We are the brush. Art is is our gift, our ministry and the medium by which we impact the Kingdom for God’s greater glory. Art is our way of bringing faith to life in living color. Our relationship with God is personal.... Our Struggles are personal. Our worship is personal. our faith really is; just how much we have truly been given. an intimate worship experience where the relationship with our Savior becomes personal. This is always so fascinating to me. Camden bought one? I want to see! What an artist! I too would enjoy watching him work. So, what piece/print did Cam purchase? The art of love and grace. Mmm - so good. I absolutely love seeing works like this come to life right before our eyes. What a gift. Thankful for people using their gifts and talents for His glory. LOVE this. Speaks to the great heart beating in your young man. And young man of God. Love that He is the passion of your son and this painter.